A cool little device, if a little fiddly. 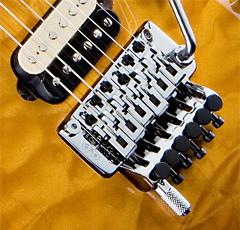 Using a guitar with a Floyd Rose type tremolo system provides you with many advantages, but of course there are always a few disadvantages. One common tuning for guitar is drop D, where the guitar is in E standard tuning, but the low E string is tuned down a whole step to D. It can be a little fiddly to tune your guitar down to drop D with a Floyd Rose type tremolo, but not impossible. The EVH D-Tuna is a great little device that attaches to standard profile Floyd Rose type tremolos, and when set up correctly it quickly enables you to tune between E and D on your low E string. There is a catch though. If the tremolo is a fully floating (i.e. can increase, and decrease pitch) then you are going to have a very hard time getting the strings to stay in tune on adjustment with the D-Tuna. Your tremolo needs to be set up to be dive-only. So if you have a guitar that isn’t constructed with a recessed Floyd Rose (no routing out under the saddle lock screws), or you can block your floating tremolo so it only dives then you will be right to use the D-Tuna. I recommend a Tremol-no (which I have also reviewed) which will allow your floating tremolo to switch between fully floating, dive only and hard tail. So once you’ve sorted out if you can use the D-Tuna on your guitar, what’s involved with setting it up? It’s a fairly simple process of replacing the low E saddle lock screw with the D-Tuna and it’s lock screw. The instructions are quite easy to follow, so it shouldn’t be too difficult for most people. The part that can get a little tedious is adjusting the D-Tuna to ensure that the string stays in tune between the Standard E and the drop D. You basically tune the low E to D with the D-Tuna popped out. Once it’s in tune to D you pop the D-Tuna “in” to the E position under the whale tail on your tremolo. Then you tune the E using the grub screw on the D-Tuna. This is the part that can be a little tedious, but once it’s done you will be able to enjoy quick tuning changes between E and D.
I have EVH D-Tunas on 2 of my guitars, and I find them to be very handy. I only have one electric guitar that doesn’t have a Floyd Rose type tremolo installed, so to be able to switch back and forth between drop tunings and standard tunings with relative ease on a Floyd Rose spec-ed guitar is a god send. I still still find that I need to adjust the fine tuner when I switch between drop D and E, but it’s only ever small adjustments. If you have a standard profile Floyd Rose type guitar (which can be set to dive-only) and you wish that you could easily switch from standard to drop-D type tunings, definitely check out the EVH D-Tuna. It’s not an entirely revolutionary device, but it certainly is a very handy little addition to your Floyd Rose.